Jump in the way back machine and head to the mid 90's - the boys action figure aisle is dominated by Hasbro. From lines like Batman, to Star Wars, to G.I. Joe, they reign supreme. Jump forward less than ten years, and look how the landscape has changed! Mattel, barely able to dent the boy's aisle for years, now holds a major portion. With licenses like Harry Potter and Batman, along with their own rerelease of Masters of the Universe, they've managed to stake a claim. Sure, it's tenuous at times - just ask any MOTU collector - but it's a stake, nonetheless. With no new Harry Potter film out last fall, the license has been pretty quiet. But with the third film, The Prisoner of Azkaban, right around the corner, the new toys are hitting the pegs. Mattel has made some big changes to the line though, and it's tough to say whether all the decisions were good ones or not. 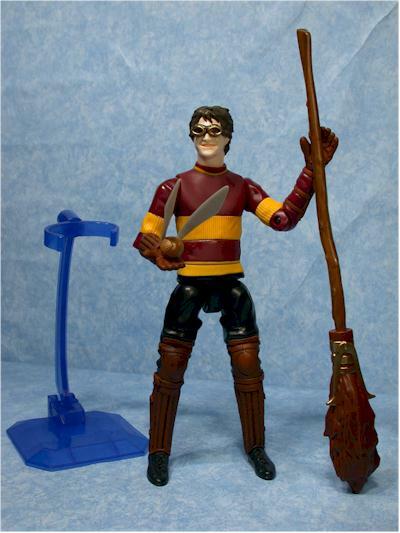 The first series of action figures, now in an 8" scale, includes Extreme Quidditch Harry, regular Harry, a Dementor, and a transforming Lupin. They retail for around ten bucks at most stores. There's also another mini-figure line, and a large 12" doll line. 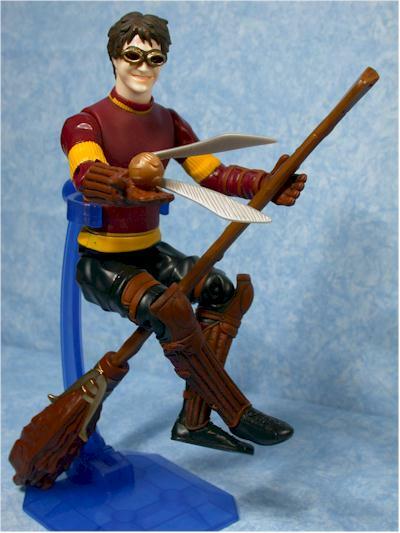 Tonight I'm reviewing the Quidditch Harry - others, especially the mini's - may get future reviews. Fairly basic, and certainly nothing particularly eye catching. Card/bubble packages for this large of figures also tend to take a real beating on the pegs. Of the four figures released, I picked this one out for one reason - I had expected to hate this figure from top to bottom. It turned out I was wrong, at least to some degree. But I wasn't wrong about the sculpt. It's terrible! 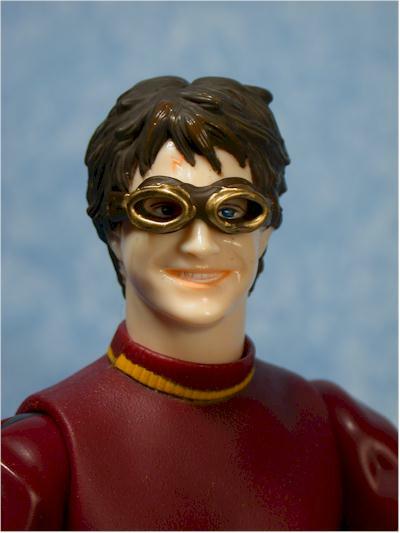 This is one of the goofiest looking versions of Harry we've ever been treated to, and I don't know who thought this God awful grinning madman looked anything like our hero. And what the hell is the deal with the goggles? I'm I forgetting some rule change in Quidditch in the third book requiring eye protection? The body sculpt is a little better than the head, but it's definitely from the school of this is just a toy for kids sculpting. They clearly assumed that meant there was little need for detail. Another aspect of the sculpt is scale. Why they switched I have no idea, and while I actually like the larger size, I also realize that they managed to alienate their previous collectors in one swift move. I have every figure from the earlier waves, and my completist gene had me hooked - but they've killed the evil monkey on my back by switching scales. Kids might have more fun with this scale, but even they will be disappointed that the new figures can't play with the old. This scale also seems like it will be a problem with any adult figures. Already, Harry doesn't seem that much smaller than Lupin, although that's tough to tell with his funky 'transformation' feature throwing things off. Generic toy work. Again, this is the cheapest and most basic level of paint ops. There's only a handful of colors, and everyone is done in a broad, simplistic style. Even then, there's poor definition between areas like the stripes and the shirt. And while Harry has never been close to George Hamilton's skin tone, he's not exactly Casper either. They've made him very pale, with an odd yellowish color for his lips and scar. Keep in mind that painting this figure in the theme of 'cheap' isn't necessarily a bad thing - til we get to the value score. Here's a category that's surprisingly good. Mattel was smart enough - or at least the product manager was - to know that even if you're going for the kids, they still want articulation if it's done well. Harry has neck, ball jointed shoulders and hips, cut biceps and thighs, elbows, wrists, knees and waist joints. That's plenty for this figure, and gives him all kinds of posing possibilities. It also adds to his fun factor, and makes the use of the nifty display stand and magnetic features, both discussed later in the review, much better. All the joints are tight, and all have a decent range of motion. Mattel gets points for giving the figure just the right amount of articulation, making it all fairly unobvious, and making it all useful. 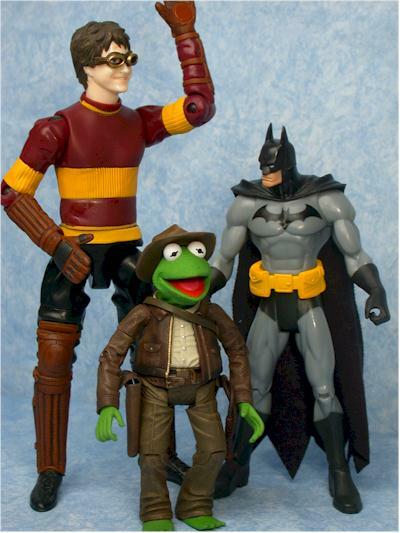 Harry comes with a nice assortment of accessories, and all make perfect sense. There's his Quidditch broom, the Snitch, and a bright blue display stand. 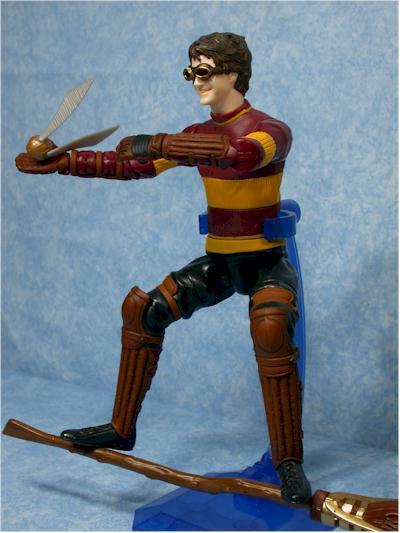 The broom and snitch both work with magnets in Harry's hands and feet. This way he can hold them at a variety of odd angles, or in gravity defying poses. The display stand snaps around his waist, and twists at the top, and moves forward and backward at the base. 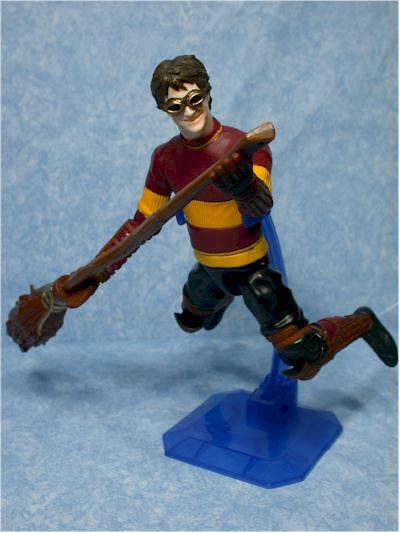 The combination of this adjustable base with Harry's articulation makes for plenty of cool poses. The 'action feature' here are the aforementioned magnets. The magnets work well, although I had to find the sweet spot on the broom to get it to hold tightly to his feet or hands. It still wasn't quite as solid of a hold as I'd like, but it wasn't bad. This really is a great toy, with lots of potential for play. The big problem is the scale, which pulls the fun factor down from four stars. Kids aren't going to have as much fun with this since they only have Harry, and no Hermionne or Ron yet. I'm sure we'll see both of them in later assortments, but right now the fact that he's pretty much on his own hurts the play value slightly. Ten bucks! Ouch. I had first found these at Media Play for ten bucks, and thought that meant they'd be closer to eight at most retailers. Media Play, being a smaller toy retailer, tends to have higher prices. But now that I've seen these at Target at the same price, and at Toys R Us for even more, I realize what an awful value they really are. Yes, they make great toys, but action figures that have cheap qualities like sculpting and paint, based on the excuse "they're just for kids", certainly shouldn't be pulling this kind of price point. 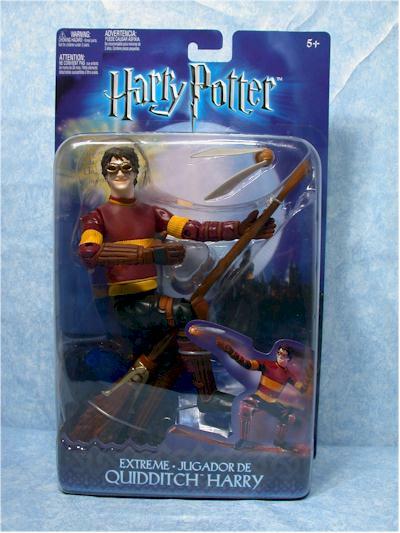 I'm not sure what 'extreme' quidditch is. Seems to me that it's a pretty extreme sport already, and unless they start playing over a lake of piranha, I'd say it's about as dangerous as you can get. Back to the figure - he's far better than I had expected. Sure, he's still no four star beauty, but kids can have a ton of fun with him. Switching scales is fairly annoying across the board, but they helped soften that blow with great articulation and play value. I love the magnet feature, and the included display base makes lots of sense. Unfortunately, at this extreme (pun intended) price point, with knock off quality paint and sculpting, he still can't rise above (pun also intended) the average. I can't guarantee the same level of fun with the other three figures, and the Dementor was particularly weak looking in the package. Bricks and mortar retailers like Wal-mart, Target, Toys R Us and Meijers are just now getting these in. You should have little trouble finding any one of them, including the Dementor.